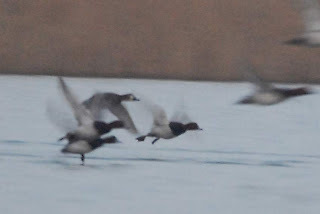 Just recently there has been an 'Aythya' duck at Cliffe on the Hoo Peninsula that has been very elusive at times and took me two attempts to finally connect with the bird. The bird was initially found on the North Quarry by Paul Larkin but when I looked for it on the Wednesday it was nowhere to be found though I did see a Grey Wagtail, heard two Green Sandpipers and a pair of Yellowhammer (a rare bird at Cliffe) and some cracking Brambling, maybe 20 plus amongst the Chaffinches at Allens Hill Cliffe. A phone call from Andrew on the next Saturday found me zipping towards Cliffe and the 'hidden pool' on the RSPB reserve. Fortunately Paul was on site still with Dave Mercer and I watched the bird for the next few hours with Mike Buckland and Marcus Lawson though it was very difficult to pick out from the Pochard that it was with. 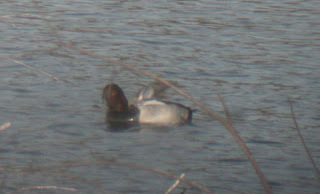 The bird at rest when asleep looked basically like a roughly Pochard sized Aythya with a slightly darker toned upperparts and darker tertials though in the bright light this was extremely difficult to see at times. The best way to pick the bird up was it's habit of 'spinning' which the Pochards tended not to do. Eventually it work up and then it's appearance changed considerably with a 'Redhead' head and bill pattern!!! 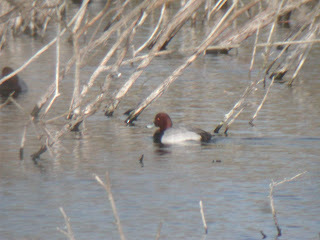 The orange-yellow eye was a bit bright but very different to the red eyes of Pochard. The photos show the bill pattern quite well with the black ink 'dipped' into the grey bill which also showed some dark at the base alike a Pochard. The time spent awake was minimal though until later in the afternoon when it started to feed with the Tufties and nearby Pochards. The photos shown here were taken on the Timber Lake and North Quarry over the next week or so and indicate the features of this bird which is a hybrid for certain but as to which species is a matter of opinion. Sadly not a 'pure' bird but a very instructive bird that helps in our knowledge of these 'aythya' delights and shows that it's always worth checking out those Pochard and Tufted Duck flocks!! Thanks to Paul for keeping me posted with the bird and it's movements.